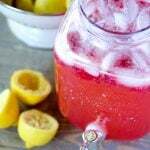 Raspberry lemonade is easy to make and will be a hit at your next summer gathering. Fresh lemons and ripe raspberries give amazing flavor and color! Roll each lemon back and forth on the countertop a few times, pressing down slightly. This helps release the juice. Cut each lemon in half and juice, straining out the seeds. Pour about three quarters of the lemon juice into about 12 cups of water. Add the raspberries and sugar. Stir constantly for 3-5 minutes, or until the sugar is dissolved and the raspberries are broken up. You may have to lightly mash the raspberries with your spoon. Taste and adjust flavor, adding more lemon juice, sugar, or water as desired. Leave juice a bit on the strong side if you are going to be putting ice in the serving container or glasses. This will allow the flavor to remain great as the ice melts into the drink. When adding the lemon juice and sugar, add less than the listed amounts. You will want to taste the lemonade and adjust the flavor according to your preference after mixing. If you are serving it over ice or putting ice in the serving vessel, leave the flavor slightly stronger than you want it to be. This will account for added water as the ice melts, keeping your raspberry lemonade flavorful.